What better way of saying "I am thinking of you" than a subscription to the original WINE OF THE MONTH CLUB™? Each month, a shipment will arrive at your recipient's address with two pre-screened wines chosen by me for their enjoyment in a beautiful linen burgundy box with your personalized gift card. Each memorable shipment includes a our 24-page newsletter "The Tasting Room" with cellaring suggestions, recipes, history and more. Give with confidence because we're the Original and Only Wine of the Month Club™. Prices include shipping, gift box, gift card, and FREE wine accessory! This is the club that started the whole wine in the mail idea (1972.) Still the most popular because the wines are sourced from all over the world and are presented for their great value and explicit representation of the grape and area from whence it came. Excellent for the novice who wants to learn about wine and great for the experience wine lover who wants good valued wine for their main consumption. As low as $39/Month + tax. Includes: First shipment gift boxed with personalized gift card, FREE wine accessory, and all shipping for the entire term of the gift. Celebrate the wine heritage of California with our selections from the California Series. Though California has been making wine since the late 1800's, the Taste of Paris in 1976 shoved California onto the world wine scene...taste from some of the great vineyards in the Golden State. This is a red wine club only. As low as $44/Month + tax. As low as $49/Month + tax. As low as $63/Month + tax. Our Cellar Series delivers 6 bottles every other month to your gift recipient...all hand selected selections from our Classic Series. The Cellar Series is a great gift for the wine lover on your list who always wants a bottle or two at the ready. As low as $98/Month + tax. This is the latest offering from the Original Wine of the Month Club. 12 bottles of hand selected wines delivered once every three months: (8) red wines and (4) white wines. Each wine is chosen from hundreds tasted every month. All guaranteed - "You never pay for a wine you do not like!" 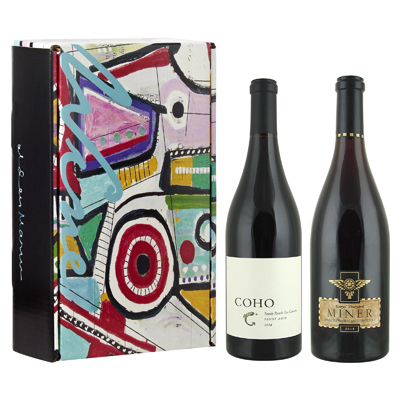 Great gift for that wine lover on your list. Enjoy! As low as $162/Month + tax. I scour the many exclusive sub-districts for well known and boutique offerings from great winemakers and deliver them straight to your gift recipient's door. As low as $69/Month + tax. These are the universally revered wines from Bordeaux, France. In the small wine district of Bordeaux, there are over 10,000 chateaux making wine. It's not just as a business but a passion of life! Two bottles will be sent to your gift recipient every other month. There is a genuine treasure trove of great Rosés that I taste each week, and now I am privileged to select 2 every other month for this diverse club. We've tasted hundreds from dozens of regions and bring you the best! As low as $59/Month + tax. We taste and evaluate hundreds of Pinots from dozens of regions to select the best. This makes an impressive gift! As low as $99/Month + tax. 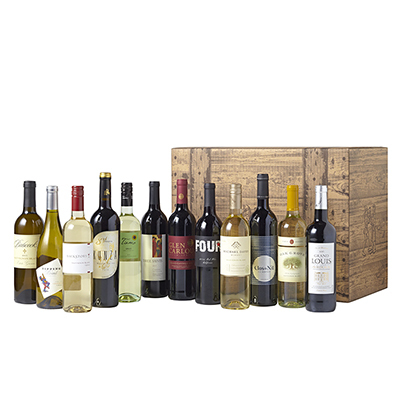 A gift assortment from the original WINE OF THE MONTH CLUB™ is a thoughtful way to give a gift of true appreciation. 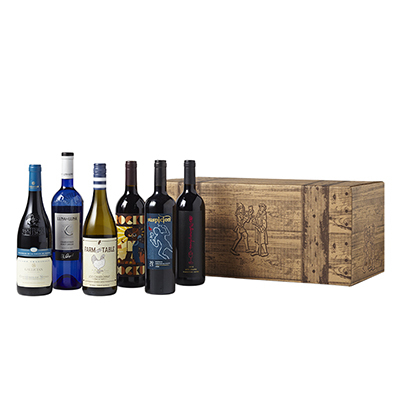 This one-time shipment is delivered in a beautiful gift box protected by an outer box to assure the wine and gift arrive in pristine condition. Each individual bottle is guaranteed... any wine for any reason can be replaced at my expense to ensure your gift recipient is "thrilled" by our selections and service. Exquisite taste and presentation are the main features of these made-to-order food and wine baskets. Each item has been selected on its quality and taste as well as its value. Every year we travel to the major food shows to obtain samples for our tasting panel. The result of this process is evident in the final products we have chosen. Each basket is hand-packed to order and guaranteed to arrive in pristine condition. Your gift recipients will be impressed. Select your gift basket with pride and confidence. There are wine clubs and there are wine subscription boxes but there is truly only one "Wine of the Month Club". Many companies try to use our name as a wine subscription box provider, but the Original Wine of the Month Club has been here since 1972 sending the best wine values available from all over the world. Join the club with confidence because "You never pay for a wine you do not like" at the Wine of the Month Club.